Elegant Japanese kaiseki dining in the Theater District. About the décor & atmosphere: Discreetly located down a flight of stairs (or via an elevator) in a bank building, Suzuki is the setting for elegantly presented kaiseki dining. Greeted by a striking crystal chandelier, guests enter through a maze of corridors in the intricately designed, eggplant and black toned subterranean venue. The feeling is one of privilege and serenity. 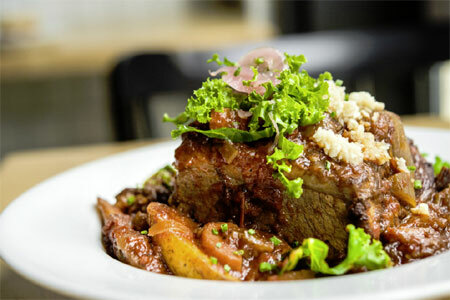 There are no crowds, attention is focused on diners, and the pace is leisurely and indulgent. 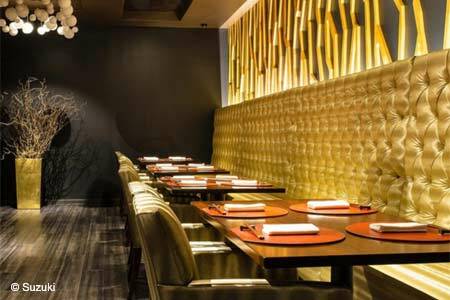 About the food: Incorporating the talents of sushi chef Toshio Suzuki (Sushi Zen, Satsuki), this 56-seat spot serves three set multi-course dinner menus of seasonal foods in a traditional style. Vegetarian, bespoke and à la carte options are also offered, while pre-theater and lunch menus represent abbreviated versions. Suzuki is helmed by executive chef and Sushi Zen-alum Takashi Yamamoto and sits adjacent to the 10-seat Satsuki omakase bar and Three Pillars bar, a cozy cocktail enclave from biochemist/mixologist Alex Ott. The experience is indulgent: seafood arrives from Japan’s Tsukiji fish market daily and forms part of the kaiseki, the gold standard of cooked food and raw fish dining in Japan. Menus, which are bookended by soup and dessert courses, change frequently, featuring seasonal river fish like ayu along with fine Wagyu beef and lean pork belly. Knowledgeable service is a given, as is the quality of the ingredients. About the drinks: Beverage pairings can be selected with sakés, wines or juices. But do start off with one of Ott’s creatively named cocktails like the Kakumei, “Mood Accelerator & Matchmaker” made from sesame shochu, blood orange, yuzu and cinnamon salt.